Product #20901 | SKU TBC402 | 0.0 (no ratings yet) Thanks for your rating! 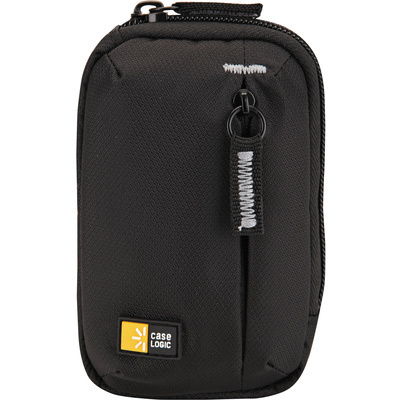 The black TBC-402 Point and Shoot Camera Case from Case Logic is a cost-effective way to travel and protect your camera. The Dobby nylon material protects your camera from the bumps, abrasions and scratches that are encountered during daily use. Your camera is accessed via single top zipper. It also contains a handy exterior zippered pocket that can hold an extra memory card or small cable. All the zippers have convenient pull tabs for use when you're wearing gloves. The case is carried using the included carabiner or belt loop that will allow you to travel hands free. The case is backed by Case Logic's 25-year warranty. FAA and airline carry-on specifications are subject to change without notice, please cheque with your airline before designating this case as a carry-on item. Most airlines require carry-on items to have an external linear measurement that is equal to or less than 114.3 cm. The external dimensions of this case add up to 23.6 cm.